When you think of travelling from Bologna to Florence in Italy, you probably think of taking the train or going by car. Instead, consider hiking the historic Path of Gods Italy trail for an unforgettable journey. What Is the Path of Gods Italy Hiking Trail? What are the Accommodations on the Path of Gods Italy Like? Who Will Enjoy Hiking the Path of Gods Italy? I thoroughly enjoyed this hike and also love the fact that as of yet it hasn’t attracted tons of hikers yet. It remains largely unknown except for a few of the lucky ones in the know. I also loved seeing a part of Italy that most travellers miss. You’ll be constantly entertained by the ever-changing landscape and cultural stops along the way. If you’re looking for an easy-moderate six-day hike, I highly recommend the Path of Gods Italy from Bologna to Florence. The journey takes an hour by car and it will take you 6 days to hike it but it’s SO worth it! And offers a unique opportunity to explore parts of Emilia-Romagna region in Italy that most travellers miss. Hikers on one of the many forested paths that make up the Path of Gods Italy. The Path of Gods (Via degli Dei in Italian) is an ancient ~135 km long route connecting Bologna to Florence through the Tuscan-Emilian Apennines mountain range. It takes five to six days to hike the route but I highly recommend doing it in six days instead of five. Otherwise, your last day is ~ 11 hours of hiking. You’re literally following in the footsteps of Romans as it retraces parts of the historic Flaminia Military Roman Road. You’ll hike through forests, on ridges with panoramic views and idyllic country roads. You’ll get a glimpse into life in Italy outside of the cities. The path is named after the five mountains (or hills, depending on your perspective). They’re are named after gods or goddesses that you climb while making your way from Bologna to Florence. Monte Adone (Adonis), is the highest one with sweeping views over the Bologna Hills. There’s also Monzuno (Mons Junonis), Monte Venere (Venus) and Monte Luario (Lua). Much of the path is on or near the top of ridges. While you’ll appreciate the fantastic views along the trail, the path was chosen here for more strategic reasons dating back to the Middle Ages. Back then, there were lots of bandits in the valleys, who have long since disappeared, and it was easier to escape them on the ridge. Being on the ridge also made it easier to see if you were going in the right direction. It was also easier to monitor the weather better. 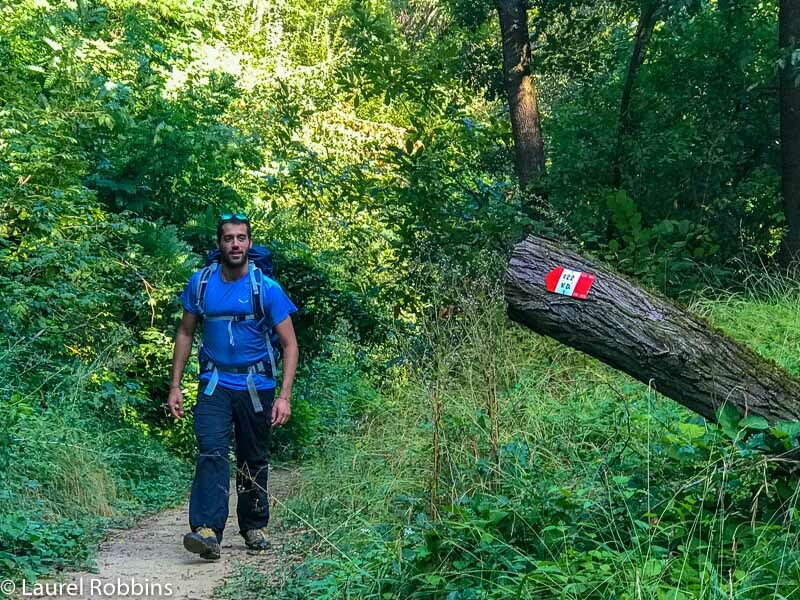 Similar to the popular Camino de Santiago, hikers can also get a hiking passport and receive a certificate at the end. You can pick one up at the Bologna Tourist Office. Just be sure to get a stamp at each of your accommodations, and then present it to the Tourist Office in Florence for your certificate. Note: This Path of Gods Italy is NOT to be confused with The Path of Gods near Positano on the Amalfi Coast. That one is just 3 hours long. This one, from Bologna to Florence takes six days. What I loved most hiking The Path of Gods Italy is that you explore a part of Italy that most travellers will only see from a train. You discover villages that you’ve never heard of, get breathtaking views, combined with fascinating cultural stops. Besides, walking on the cobblestones of an ancient Roman Road, you can visit the sanctuary of the Madonna di San Luca, a basilica in Bologna that’s a UNESCO World Heritage site, explore a Roman Aqueduct, visit the German Cemetry, and make stops at other churches and monasteries along the way. There are also opportunities for side trips if you want to try other activities, like visiting Rocchetta Mattei, a castle built by a mysterious count, try your hand at orienteering or cool off with water sports at Lake Suviana. 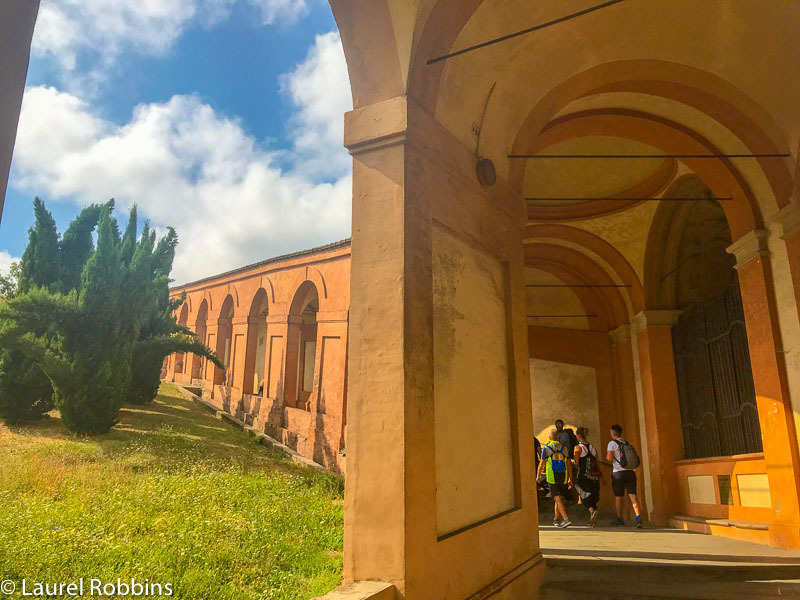 You’ll see the Sanctuary of San Luca while hiking for several days. The route so far is mainly popular with Italians so you also get the chance to meet and connect with locals. It’s also not well-known yet, especially internationally, unlike the very popular Camino de Santiago. This is a huge bonus in my books. You’ll meet other hikers, but not be surrounded by them. And the food! Bologna and its surrounding area have arguably some of the best food in all of Italy. Yes, I know that’s a huge claim but you will eat incredibly well. This was the only multi-day hiking trip that I’ve ever done where I didn’t lose weight! 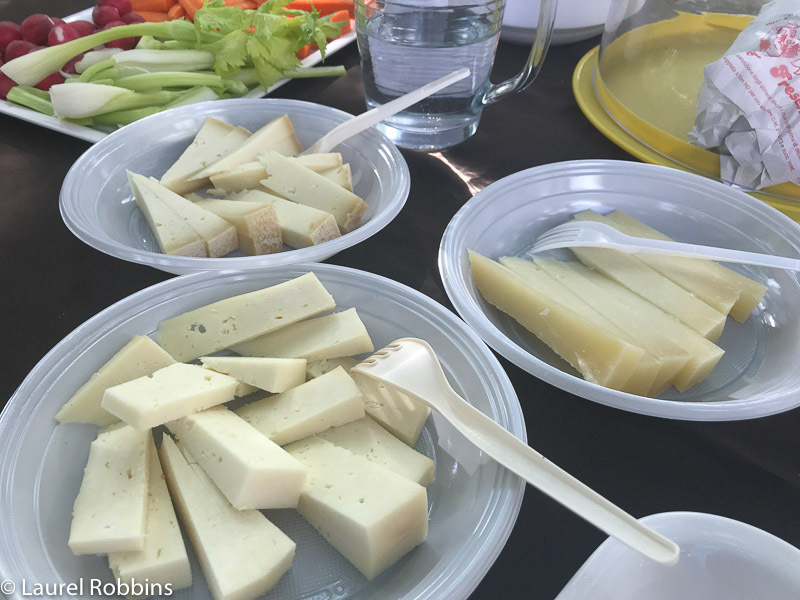 Travel Tip: When you’re in Bologna, check out my friend Rachelle’s Food Lover’s Guide to Bologna. You’ll quickly see what I mean about the food. Finally, the Path of Gods Italy is having a positive economic impact on local communities. My guide, Gianluca said that 51 new accommodations have opened in the last five years because of the trail. Note: I hiked ~ 118 km of the 135 km long route. The itinerary below is what I personally did. I arrived in Bologna, the day before, but would recommend arriving a few days earlier. The Hotel Internazionale is conveniently located and I really enjoyed my stay there. The first day of hiking is mostly in Bologna. We started by making our way under the longest portico (archway) in the world. It’s an incredible 6 km long to the Sanctuary of San Luca, a basilica that is a UNESCO World Heritage Site. I loved following the ancient pilgrimage route. We walked alongside locals who walk at all ages to give thanks for something good that’s happened in their lives. After that, we left Bologna and made our way through Bregoli’s Path, a 1.7 km long forested path to reach Talon Park in Casalecchio di Reno. Here you’ll find the 15th-century palace and gardens of the Marquis Talon Sampieri, a 15th-century palace owned by the Sampieri family. I loved the walk under the 600 porticos to San Luca. It’s a gorgeous way to explore the city and I loved learning about the history of the porticos. We took a private shuttle to the Cantina Floriano Cinti Vineyard for lunch and a wine tasting. They serve typical food from Emilia Romagna and we tasted 5 different wines with each course. Foodies will love this excursion. Exploring the ancient Roman aqueducts is a fun adventure. After lunch, we also explored the Roman Aqueducts which date back to B.C. This is a unique adventure where you will actually walk, sometimes crouch down through the narrow aqueducts. It’s available with a guided tour only and needs to be arranged in advance. The tours can last several hours but we were there for ~ an hour which was fine for me. I found it a bit claustrophobic after a while. You’ll be provided with a jumpsuit to put on over your clothes but you will still get dirty so keep this in mind. I stayed at Hotel Ca’ Vecchia. I loved the wooden beams on the ceiling and the huge park. It was very peaceful. We cheated a bit and took a transfer to Prati di Mugnano where we started hiking with fantastic views of the Bologna Hills. Then, we made our way up to Monte Adone (Mont Adonis), a dramatic sandstone cliff and the highest mountain in the Bologna Hills. We enjoyed our packed lunches on Mont Adonis before hiking down to Brento and going off the Path of Gods Italy to visit a castle. More on that to follow. I don’t know what I expected from hiking in the Bologna Hills, but it certainly wasn’t the spectacular wind-swept dramatic cliffs of Mont Adonis. It was also comforting that you could still see San Luca. Somehow, it provided a sense of peace when I would spot it from various points along the trail. I also loved the visit to Rochhetta Mattei. See below. Visit Rocchetta Mattei. It’s a castle built by Count Cesare Mattei in a Moorish style. Located near Riola, ~45 km from Bologna. We drove but it’s also possible to reach it by public transport. It’s one of the most unique castles I’ve ever visited. Perhaps that’s fitting since Count Cesare Mattei was considered rather mysterious, and an eccentric. So what was so mysterious about this count? He would treat poor people with homoeopathic medicine for free. The Count would also eat with servants when there were no guests visiting. It was considered very unorthodox at this time. Note: It’s only open on weekends and tickets are often sold out a month in advance so plan your visit early. Alternatively, if you’re travelling with a group, you can also arrange a private tour during the week by arrangement. I stayed at Farmstay Agriturismo Prunara and loved the stone farmhouse. The dinner was delicious. It’s family-run and you’ll meet the kids for a very authentic stay that you wouldn’t find at a regular hotel. Today we hiked up to reach a chestnut forest until we reached the top of Le Croci. There’s also Visione Trittica, a natural art gallery right on the path. Then, the route follows a ridge with gorgeous far-stretching views of fields and hills before hiking down to the town of Madonna dei Fornelli. I loved the natural art gallery, especially the eye-catching Visione Trittica. The picnic area pictured above was also special. I had the entire place to myself! Test your sense of direction with orienteering offered by Polisportiva Masi near Pian di Balestra, ~ 7 km from Madonna dei Fornelli. It was my first time orienteering and I really enjoyed it. Me and Elisa, one of the owners of B&B Romani. I stayed at the B&B Romani. The rooms are simple but the garden area is lovely and the owner, Elisa is warm and welcoming (pictured above) and an excellent cook! This isn’t on the Path of Gods but we wanted to see what else the area had to offer, so we took a break from hiking to try some water sports at Suviana Lake. Besides swimming, the Centro Velico de Suviana (Sailing Centre) offers you a choice of SUP, canoeing, sailing or windsurfing. We stayed in the same accommodation as the previous night. Today is filled with both hiking in forests and cultural highlights. You’ll walk sections of a thousand-year-old Roman Road and Futa Pass. Here you can visit the German War Cemetry where 30, 683 German soldiers are laid to rest. I really enjoyed the scenery today and following in the footsteps of the Romans. 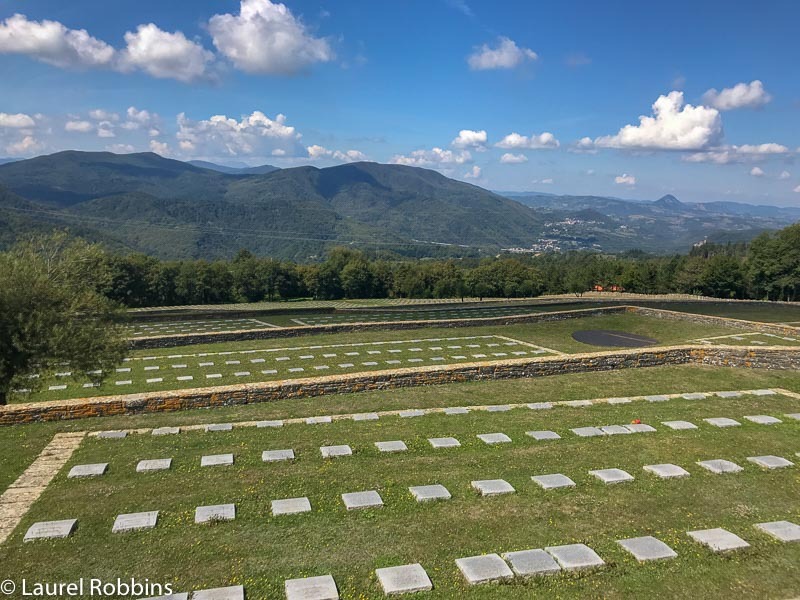 It was sobering to learn more about the battles that took place in the Apennines. Despite significant losses on both sides, I found it incredibly admirable that Italy allowed a former enemy graveyard in the 1950s, so soon after the war was over. Today’s accommodation is also a highlight and the best on the trip. After a day of hiking, I looked forward to cooling off with a dip in the pool with sweeping views over the Tuscan countryside. I stayed at the Podere Belvedere. This accommodation is gorgeous and the owners are lovely. It will also be some of the best food that you’ll eat on the entire trip. For a memorable evening consider dining under the stars. This was my favourite meal and dining experience on the trail. We hiked on a forest path before reaching a road. Here we stopped at Bacciotti to sample some local cheeses, which I highly recommend. Further down the road is the Convento di Bosco ai Frati. It was rebuilt by the request of the powerful de’Medici family. They donated many priceless gifts. The convent is also home to the only naked Jesus recognize by the Catholic Church. You can’t make this stuff up :). Cheese tasting at Bacciotti. I highly recommend stopping here. Although my highlights usually involve the hiking, today it was the stop at Bacciotti. I love cheese. And the chance to sample it from a family-run place who takes great pride in their cheese making skills was unforgettable. I stayed at the B&B La Pieve located in the heart of San Peiro a Sieve. The owners were friendly and the rooms were filled with personal items that gave the rooms a cozy feeling. 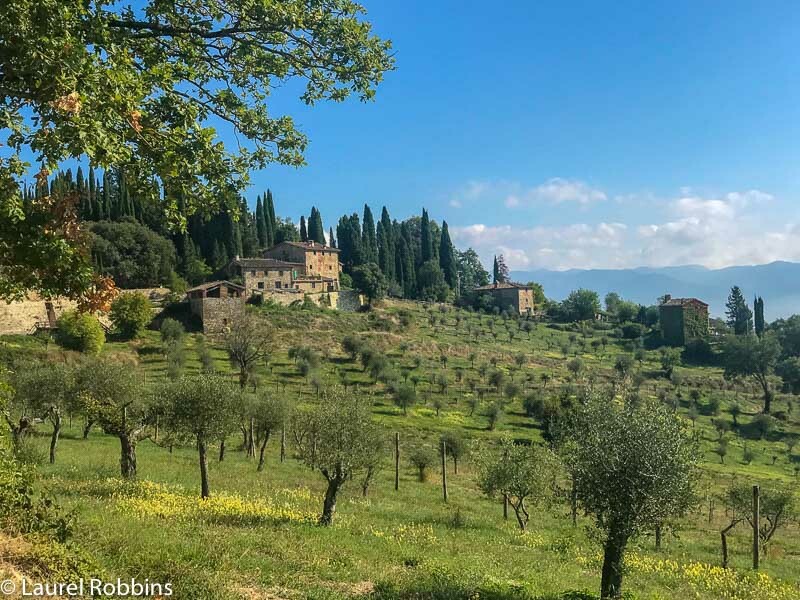 I loved hiking past the olive groves and Tuscan farmhouses. Today is a long but beautiful day of hiking filled with interesting stops along the way on the Path of Gods Italy. We hiked past the ruins of the Badia del Buonsollazzo. It’s a Benedictine monastery found in the 10th century by Count Ugo di Toscana. A little further on we came across Montesenario Sanctuary (Monte Senario). It’s one of the most important hermitages in the area and dates back to 1233. Just a few minutes past the Montesenario Sanctuary is the greatest icehouse in Europe. I loved the Montesenario Sanctuary which makes for a great picnic spot. Check the opening hours first though as I was there around 12:00 and it was closed until the mid-afternoon. I also really enjoyed the first part of the hike through the olive groves and farmhouses. You get to experience a different side of Italy that most tourists miss. I stayed at Hotel Dino. The large terrace offers sweeping views of Tuscany which I thoroughly enjoyed. While the hike officially ends in Florence, many hikers choose to end their hike in Fiesole. It’s a town just 5 km outside of Florence with views over the city including the cathedral. If you’re continuing on, be sure to take some time to enjoy the views over Florence. From Fiesole, the hiking is uninspiring. You’re hiking along roads that soon turn into the busy streets of Florence. I knew this in advance but still did it as I wanted to complete the route. The official ending spot is Piazza della Signoria in Florence. It’s absolute mayhem. I felt completely overwhelmed by all the tourists after hiking in mostly silence for the past week. Still, I was glad that I had hiked to the finish point since I’m a bit of a purist when it comes to hiking. It also made me really appreciate the peacefulness I had experienced the past week hiking the Path of Gods Italy. My favourite cappuccino stop was in Fiesole. This was my favourite cappuccino stop which was rare on the trip. I loved every sip of it and soaked in the views. Piazza della Signoria in Florence is overwhelming after hiking in so much peace and quiet for a week. Although I felt overwhelmed by the hoards of tourists at the end, I was also pleased that I’d finished the Path of Gods from Bologna to Florence. I didn’t stay in Florence but returned back to Bologna where I spent some time exploring. Check out these free 10 things to do. There are no shortage of places to stay in Florence but if you’re looking for something quieter, consider staying in the ancient town of Fiesole. You can do the Path of Gods on either a privately arranged guided tour through Bologna Welcome and they’ll also arrange your luggage transfer. In that case you just need to bring your day hiking gear. It’s also possible to do as a self-guided tour. The path is well-marked and I’ve included the names of the accommodations above. If you do it as a self-guided tour you’ll want to get this map. You can either get it at the Bologna Welcome Tourism Information Office or order it from the link above. If you choose the latter, allow plenty of time for shipping. Most of the accommodations are small simple family-run establishments in rural areas or small towns. The exception is Podere Belvedere which offers more upscale, but still reasonably priced accommodation. I loved this place. You should book your accommodations in advance since they are limited. In addition, your stay has a positive impact on the local communities that are along the Path of Gods Italy. Tourists do not flock to these places in the masses. These communities rely on hikers from the Path of Gods Italy for a good portion of their income. As a result, the hosts are some of the most welcoming that you’ll find anywhere in Italy. I recommend bringing a packed lunch. You can either buy one from a grocery store on the nights that you’re staying in a town or ask your accommodation the night before to prepare one for you. This is what we did and it worked out great. Most days there won’t be any place to buy one so you need to plan in advance. We also brought local snacks from Alce Nero (which also has some gluten-free products) and chocolate from Majani, a Bologna chocolaterie in business since 1796. I also loved 24 Bottles, another local company, which produces lightweight bottles and keeps your water coolf or 24 hours. If you want to see a side of Italy that most travellers miss you’ll enjoy this hike. It’s also a great fit for travellers wanting to combine an active vacation with seeing some of the lesser visited but still impressive sights that Emilia Romagna and Tuscany have to offer. Check out this video from Travel Dudes which shows you more of the path. Anyone who is reasonably fit can hike the Path of Gods Italy. There are a lot of ups and downs but it’s never too steep. Having said that, there are some long days so be sure that you’re comfortable hiking up to 30 km in a day. While it’s possible to hike it in 5 days, I highly recommend doing it in 6 days. Otherwise, the last day is almost 35 km of hiking which takes ~ 11 hours. When Is the Best Time to Hike the Path of Gods Italy? The best months are April, May, June and September, followed by October and November although it can be rainy in October and November. From December to March, there will likely be snow on the trail so while it’s possible, it does make it more difficult. It’s also possible to hike it in July and August but it will be very hot. So if you do it then, you’ll want to get an early start each day to avoid hiking in the hottest part of the day. Note: Thank you to Bologna Welcome for making my trip to hike The Path of Gods Italy possible. As always, all opinions expressed are my own.